Yes, it still felt good the morning after, and even still a month and a half later when it seemed the entire city paused on a cold and bright January morning to revel once again in this historic moment. 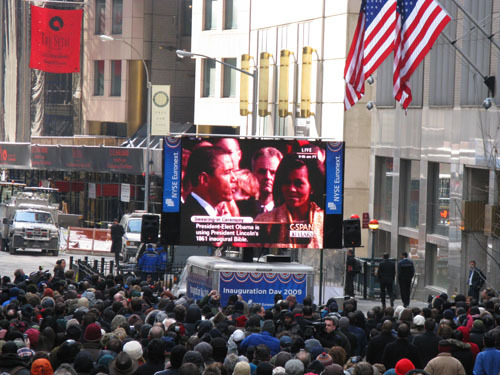 Obama’s inauguration was broadcast on screens large and small throughout the five boroughs. 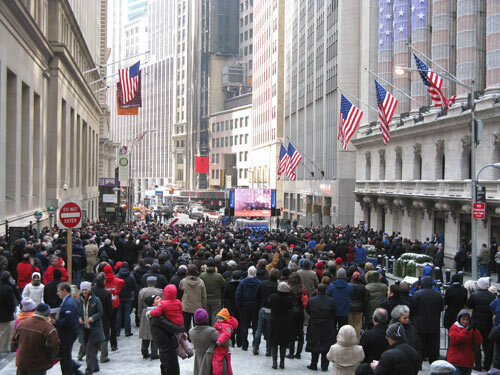 In the Financial District, productivity plummeted (and Internet connections slowed) around 11:30AM as workers put aside their work to watch the event on their computers or office television sets. I made my way to the Jumbotron screen set up outside the New York Stock Exchange where the crowds were quickly building, arriving just in time to hear a sparkly bow-topped Aretha Franklin belt out “My Country, Tis of Thee” before Joe Biden’s swearing in by Justice John Paul Stevens. 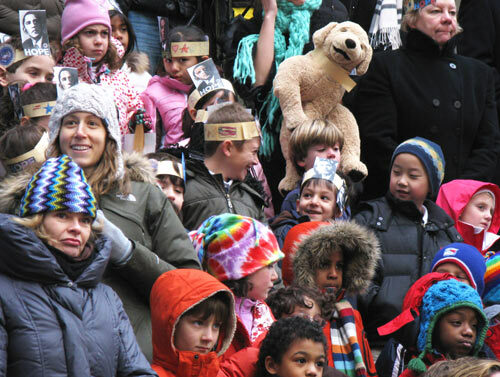 Several hundred people filled Broad Street despite the freezing temperatures — though no comparison to the crowds that were shown at the Mall in DC. Crowd estimates there varied wildly from 1.5 million to 4 million — though most of the time, the figures are almost entirely made up anyway; the Associated Press stayed conservative with their report of “more than 1M“. I believe it. The musical selection lead-in was by John Williams with snippets of familiar melody lifted from the traditional Shaker hymn “Simple Gifts,” which Aaron Copland also famously borrowed for his “Appalachian Spring“. The tune broadcasts Inspiration, capital I, especially when rendered by Itzhak Perlman and Obama’s favorite cellist Yo-Yo Ma. Even if the music was pre-recorded. 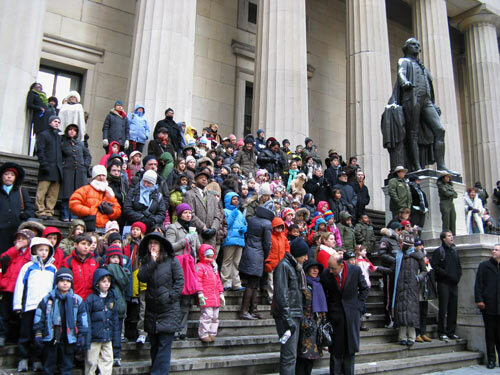 The assembled crowd cheered riotously, among them several dozen schoolchildren in homemade Obama headgear, who had gathered with us on the steps of Federal Hall. Our new president delivered a measured, somber speech on this jubilant day, one which garnered generally favorable reviews. I did appreciate the nod to American songwriter Jerome Kern (at 1:03) — and yes, friends, this song was written in 1936, but it’s a standard, and it was performed by Fred Astaire and Ginger Rogers, so therefore not so strange that I recognized the reference… geez! Check out the full NYSE Inauguration simulcast Flickr set here. 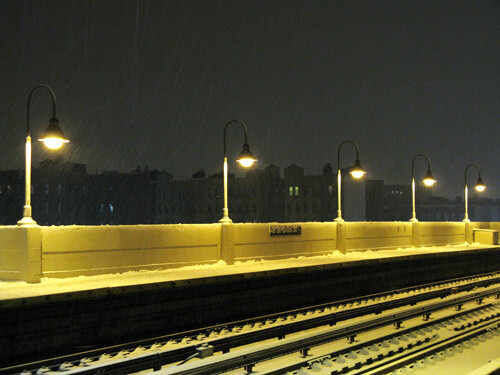 It was a snowy Sunday when we all gathered in Sunnyside… complicated further by travel detours due to the seemingly endless track work on the 7 line. No service between Queens and Manhattan until March? Why do these disruptions always seem to coincide with Chinese New Year? Tonight marked my first attempt at making a pineapple upside-down cake, and aside from the nerve-wracking sequence of inverting the cake pan layers atop one another (parchment helps a lot), I think it turned out pretty well. I first heard of this dessert on The Jetsons animated series in the early 1980s — it was Rosie the robot maid’s specialty! 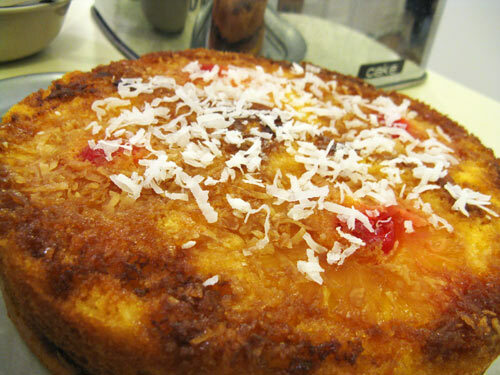 — not realizing then that it was an actual cake and not some fanciful futuristic Hanna-Barbera invention. Much later than I care to admit, I learned that, in fact, it’s an American classic with origins dating to the turn of the last century. Maraschino cherries, by the way, are maddeningly difficult to locate in a supermarket if you’ve never had occasion to buy them before. In the canned fruits section? Baking supplies? Pickles? Drink mixers? No, no, no and no. At my local Food Emporium, at least, the bright red jars are located just off the ice cream freezer cases, near the colored sprinkles. Well sure, that makes perfect sense… in retrospect. From one of my favorite magazine features: New York‘s annual “Reasons to Love New York — Especially Now” issue. Reason #1: Because Obama Is One of Us, Despite All That Business About Chicago.